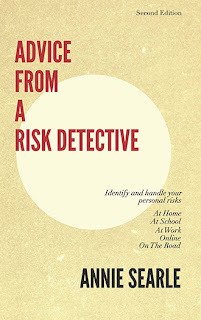 Advice From A Risk Detective: Book reviewers. A reporter asked me yesterday how I chose the six experts to review my new book. "You're pretty well-connected," she said. "Was it hard?" It's close enough to launch time to say who they are, and I would guess that you'll be able to figure out why I asked them if they wanted to read and comment. Pete O'Dell -- founder of Swan Island Networks, and author of Silver Bullets: How Interoperable Data Will Revolutionize Information Sharing and Transparency. Alfonso Martinez-Fonts -- former DHS Undersecretary for the Private Sector, now at the U.S. Chamber of Commerce. Catherine A. Allen -- Chairman and CEO of The Santa Fe Group. Dr. Kevin C. Desouza -- author of Managing Knowledge Security and a host of other books. He's just become director of The Metropolitan Institute at Virginia Tech. Why Don' t More People Take Calculated Risks? From Princess of Darkness to Risk Detective.